The Flash Forge 3D printer dual extruder w/2 ABS spools at $1199 has the most and highest reviews. We covered that the go-to online retailer, Amazon, wisely launched a 3D printing store recently. It’s technically listed as an “Additive Manufacturing Products” section, but that’s just a synonym of 3D printing. We thought it prudent to give a snapshot view of the the review-heavy retailer’s new addition. 3D Printers – Pretty self explanatory. There are kits and fully assembled printers, ranging from the popular to, strangely, the discontinued. I’m referring to the Bits From Bytes 3D Touch that’s not only listed, but it’s used as the picture for the 3D Printers subsection. Weird. 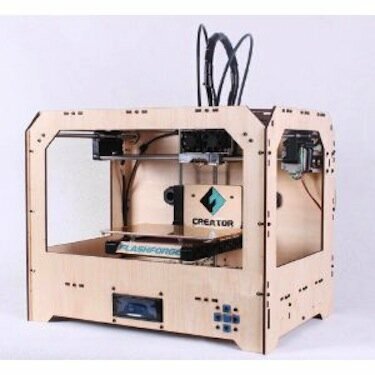 Otherwise, the section has a few of the more well-known printers, like the Afinia H-Series, the second generation Cube, and the MakerBot Replicator 2, as well as some lesser-known printers like the Airwolf and LulzBot. Interesting tidbits: the Afinia is offered in several bundles with filament and finishing tools, the Cube is available for less than from Cubify, the Replicator 2 has been out of stock every time that I’ve checked, and the printer with the most and highest reviews is the Chinese-manufactured FlashForge with dual extrusion and two spools of ABS for $1199. Filament – Also self explanatory. Quality and affordable filaments from various sources, including Taulman nylon and LayWoo-d3. Parts and Accessories– You’ll find everything from extruders, Kapton tape, digital calipers, belts, Borosilicate glass platforms, and finishing tool kits here. This is essentially a maintenance, repair, and upgrade section. 3D Printer Books – A digital shelf of literature concerning 3D printing, from 3D Printing for Dummies to the (totally free!) Kindle Edition of 3D Printing: The Next Technology Gold Rush – Future Factories and How to Capitalize on Distributed Manufacturing. CAD Software – If you need something more powerful than the free modeling programs out there, Amazon has pages of CAD programs and tutorial DVDs. Granted, a large chunk is Autodesk software, but there are others too. There are benefits to buying your 3D printers, accessories, and supplies from Amazon, namely their outstanding return/warranty policies, free Super Saver and Prime shipping, and the aid of reviews. And the prices, especially with free shipping, are hard to beat.